In the summer of 2001 we decided that a dog would be the ideal addition to our family. 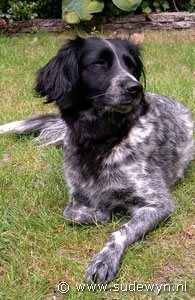 We wanted a family companion as well as a sportingdog, and we had quite a list of wishes and requirements. 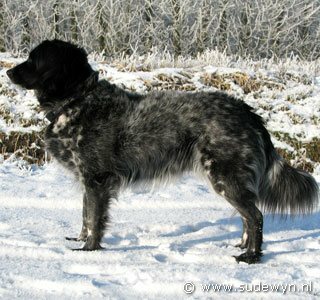 We ended up at a breed called Stabyhoun (otherwise known as Frisian pointer or Dutch Staby), of wich we had never heard of before. 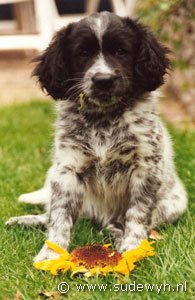 Mickie was our first introduction to this wonderful breed. At the time, we could not have foreseen it would lead to a time-consuming hobby, bringing about great joy and pleasure. From puppy class, through beginners and advanced to obedience level 1 ... the pleasure in working grew for the both of us and before long, we were entering national obedience competitions. Meanwhile we started retrieval training; it's based on gundogtraining but only makes use of dummies, not of (cold) game. Mickie, gundog in heart and soul, simply loved this sport. She quickly earned her A-certificate, but then bounced on fear for the gunshot. Thanks to her enormous will to work, we managed to turn that fear into even more retrievingdrive. 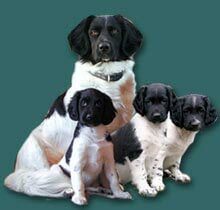 At present, we hold all diploma's and certificates available in de sports of retrieving and obedience. In both disciplines we compete at the highest level, but still, we're never done learning. Recently, we started working with (cold) game, and the level of difficulty in training still rises. Enough challenges left! Mickie is not a purebred. Since we know little or nothing about her parents and ancestors, we're not breeding with her. Mickie passed away on January 27th 2015 at the age of 13,5. She is dearly missed.